The U.S. D epartment of Energy (DoE) has announced that the world's biggest laser is ready to start blasting away after 12 years in the making. The $3.5-billion stadium-size National Ignition Facility (NIF), housed at Lawrence Livermore National Laboratory (LLNL) in Livermore, Calif., consists of 192 separate beams, each of which stands as the most energetic ever built, says LLNL spokesperson Bob Hirschfeld. Very much like the Death Star, the gigantic space station in the movie series Star Wars (“That’s no moon, ” speaketh Obi Wan Kenobi), the beams will focus on a single point to unleash their full, joint potential. The target: a BB-size pellet of frozen hydrogen in the center of a 33-foot- (10-meter-) diameter chamber. The ultraviolet lasers should heat the pellet to hundreds of millions of degrees, forcing nuclear fusion to occur—the same superhigh heat and pressure atomic reaction that fuels the stars. Scientists have long hailed fusion as the ultimate clean energy source—hydrogen is abundant, though producing and storing it remains economically unattractive. Unit for unit, though, the amount of energy that could be generated via fusion with even a tiny bit of hydrogen fuel is astronomical (think: E=mc2) compared to any other power-making scheme in operation today. Crucially, the lab expects to generate a net amount of energy, reaching the milestone that has plagued other laboratory attempts at developing fusion as a future energy source, according to Hirschfeld. 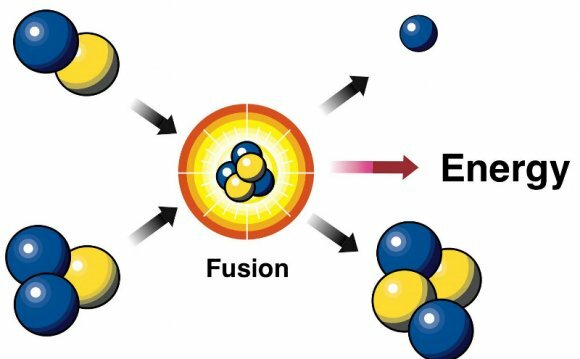 A fusion reaction requires an immense amount of energy to get going, robbing its potential power output, and harvesting and storing that energy is another task altogether. Currently, NIF’s lasers cannot fire anywhere near quickly enough to sustainedly produce energy, Hirschfeld says, noting that not one watt of energy for commercial purposes will come out of NIF, which stands as a proof of principle experiment. Beyond gunning for fusion, NIF could also one day focus its lasers on burning up some of the spent nuclear fuel from power plants that now sits in on-site pools or cement casks. For years, the U.S. and other nations have grappled with what to do with this radioactive waste. (The Obama administration recently canned long-standing plans to bury it in Nevada's Yucca Mountain.) NIF, or a facility based on its technology, could use these leftover fissile materials in place of the hydrogen pellet to generate power, while getting rid of volatile nuclear material. Other NIF missions include updating supercomputer simulations of the nation’s aging nuclear stockpile, which cannot be tested due to a 1992 moratorium. Astrophysics work on the fusion in stars and materials science will also take place at NIF. ("We'll be squeezing materials harder than they have ever been squeezed, ” Hirschfeld says.) Despite any Darth Vader–like urges to the contrary, though, the NIF lasers will not see service in blowing up rebellious planets. Inside the targeting chamber at NIF. The target positioner extends from the right [top]. Laser Bay 2 (of two) where the lasers are generated at NIF [right].